Queen Elizabeth II shakes hands with Professor John Hudson. 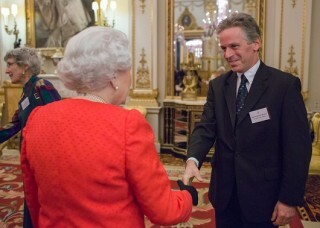 John Hudson, Professor of Legal History at the University of St. Andrews, was one of three mediaeval historians to attend the event at Buckingham Palace in the presence of the Queen and the Duke of Edinburgh, and the Princess Royal. This article was first published in the website of the University of St. Andrews and is reproduced here with their kind permission. An expert on medieval law at the University of St Andrews has met the Queen at a special reception to mark the 800th anniversary of the Magna Carta. Among the guests at the overseas human rights conference in London sponsored by the Magna Carta Trust were Lady Brenda Hale the deputy president of the Supreme Court of the United Kingdom, Lord John Thomas of Cwmgiedd, the lord chief justice of England and Wales, and the former Attorney General, Dominic Grieve. The Queen is the patron of the Magna Carta Trust. ‌Overseas guests included the president of the French Conseil d’Etat, the Finnish justice minister, and representatives from the Middle East, Africa and Asia. On display at the reception was a facsimile of a British Library copy of the 1215 charter. Contrary to popular belief, there is no single original manuscript of Magna Carta; rather it was issued in multiple copies, of which four survive. The original copies of the 1215 charter had been brought together at the British Library earlier this month for comparison. This was the first time since 1215 that they had been in one place together. Professor Hudson said, “Buckingham Palace provided a majestic and peculiarly fitting setting for celebration of a document extracted by rebels from an unwilling and unpopular king, but rapidly transformed into a repeatedly granted royal promise of good government within the realm. The guests came from across the globe, gathering in London to consider the standing of Magna Carta as a present-day symbol of commitment to justice. Professor Hudson has recently given a paper on the Magna Carta in Oxford, and is delivering the Allen Brown Memorial Lecture in Cambridge in July, on the process of drafting Magna Carta. He is also co-editing a third edition of J.C. Holt’s classic work Magna Carta (forthcoming, Cambridge University Press, 2015). Although there had been legislation in England since well before 1066, Magna Carta is the first legislative document of any kind whose text was known to thirteenth-century lawyers and justices and used by them, and there is a continuous history of its use and interpretation and re-interpretation since then by lawyers and judges. Magna Carta embodied an important commitment by the king on behalf of himself and his successors to due process and the rule of law. In this sense it is the foundational document of the Common Law tradition .